Below you will find valuable resources about the great knives from Queen Cutlery. The History In 2005, David A. Krauss, Ph.D. wrote a fantastic summary about the origins of Queen Cutlery. You can view that article here. Image Gallery This link will bring you to AAPK’s Queen specific image gallery. You will find many pictures of Queen knife patterns. We urge you to upload additional pictures to this gallery if you have some! Queen Specific Knife Discussion Board This is a great place to chat about Queen knives. We welcome show & tell, Q&A, and much more. 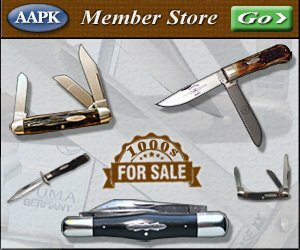 Queen Knives for Sale at AAPK Click here to view all of the Queen Cutlery knives available for sale in the AAPK member stores.